Concussions are becoming more common in professional football, according to a new N.F.L. report out last week, and a growing number of former players have announced their diagnosis of chronic-traumatic encephalopathy (C.T.E. ), a degenerative brain disease linked to concussions that for many leads to dementia. 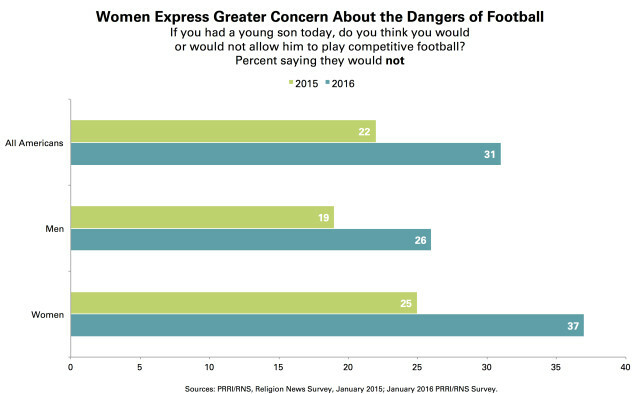 The fourth annual PRRI/RNS religion and sports poll helps us better understand American attitudes about professional football and the growing concerns about the danger posed to players. In general, Americans generally perceive professional football as a uniquely dangerous sport. More than seven in ten (71 percent) Americans agree that football is more dangerous than other sports. The poll also revealed that the dangers posed by football are leading an increasing number of Americans to prohibit their children from participating in the sport. Today, nearly one-third (31 percent) of Americans say that if they had a young son today they would not allow him to play football, while only 22 percent said they would not allow their son to play one year earlier. Notably, women are more likely than men to say they would prohibit their son from playing football: 37 percent of women, compared to about one-quarter (26 percent) of men, say they would not allow their son to play. Women also express greater concern on the issue, with an astounding 12-percentage point jump on the issue in just one year. There is also a class and ideological divides in concerns about football. Americans with a four-year college degree are substantially more likely to say they would forbid their child from playing football than Americans with a high school education or less (41 percent vs. 28 percent, respectively). Americans who are politically liberal also express greater fears about having their children compete in the sport than conservatives. Close to four in ten (38 percent) liberals say they would not allow their son to play football, a view shared by only one-quarter (25 percent) of conservatives. Read more of the fourth annual PRRI/RNS religion and sports survey. There’s Nothing More American Than Apple Pie and . . . Football and Soccer?